Whether they are made of porcelain, acrylic, ceramic tile or glass, shower walls and doors are notoriously difficult to keep clean. 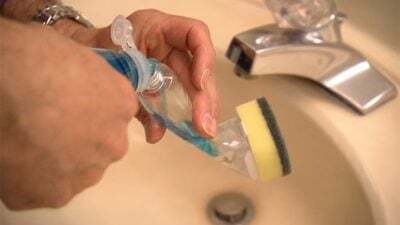 Fill a soap-dispensing dish scrubber with half grease-cutting dish detergent and half white vinegar. Scrub the surface, then wipe with a cloth or paper towel. My local station (abc affiliate–Providence) now has today’s homeowner on at 5:30 a.m. : ( on Saturday. Not fair! Previously it was 7. Anything you can do on your end? Test first and make sure that the soap wand has a non-abrasive pad. They come in a couple different types. The ‘green’ kind will certainly scratch the plastic. Also, I’d mix the solution before pouring it into the wand. It looked like the vinegar just ran out. Abrasive pad on acrylic wall? Wouldn’t it scratch? We love to hear that, John. Thanks for watching!